These four drawing shown above were the next step in the design process. These are when I was allowed to draw and doodle whatever came to mind, basically a free think time. These are some of the four that stuck out the most to me and are the designs I continued on with these ideas throughout the rest of the project. 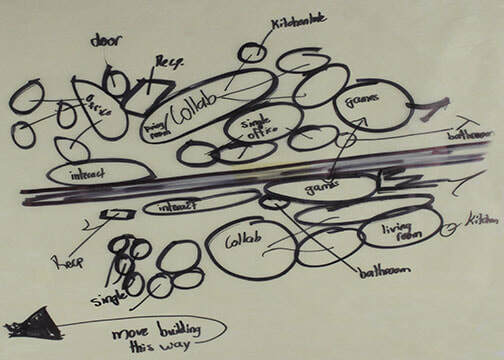 To make these spaces I used what I learned from the verb study drawings to alter the spaces in these sketches. These drawings are the final site/floor plan and all elevation planes. 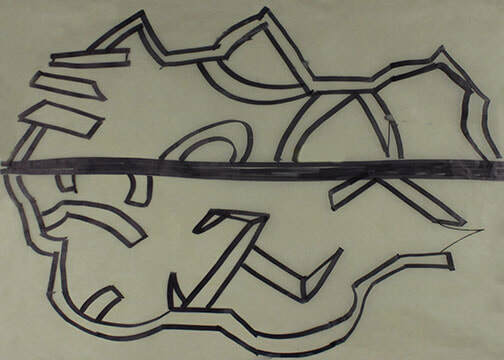 I translated the drawings on the tan trace paper into a design program called Auto Cad. With this program I refined my drawings to best of my ability and this is the final product of the project. For the connection element in the building I had glass wall for people across the wall to be able to see each as well as one outside the building. The building consists of office spaces, a bathroom, technology room and lounge/living room and a small kitchenette. 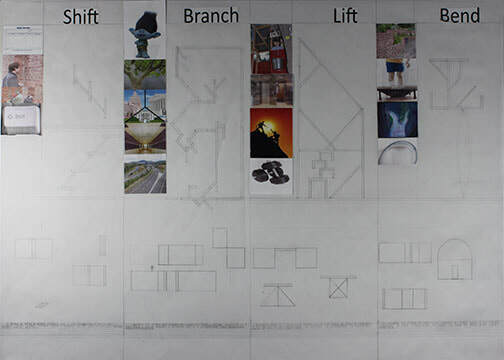 The images in the drawing to left are pictures of a model at 1/8"=1' scale of the building I designed. The slideshow contains many different views of the model including: views of the Mexico, views of the US side and a section view which is looking at the wall and being able to see both sides with an accurate sunlight. These models are to better understand the spaces I created in my drawings so people can understand my ideas and concepts better than they did before.